Centamin's Sukari gold mine, Egypt. 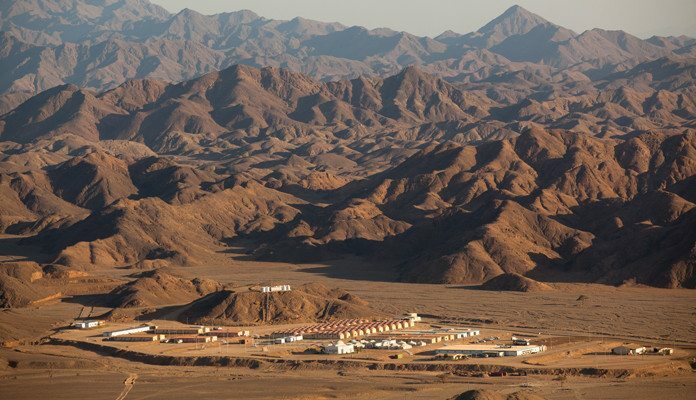 CENTAMIN, the UK-listed gold producer which operates the Sukari mine in Egypt, more than doubled its first quarter profits owing to higher production, better prices, and lower sales costs, said Reuters in a report. Centamin’s profit before tax rose to $65.4m in the three months ended March 31, from $29.47m a year earlier, the newswire said. Gold sales rose 13.9% to 131,045 ounces, while average realised gold price rose about 9% to $1,328/oz. Cash costs of production fell about 11% to $71.3m, pushing unit costs down 21% to $581 per ounce produced. Commenting on the outlook for full-year production, Centamin said that its guidance of 580,000 ounces at forecast cash cost of production of $555/oz and all-in sustaining costs of $770/oz was intact.